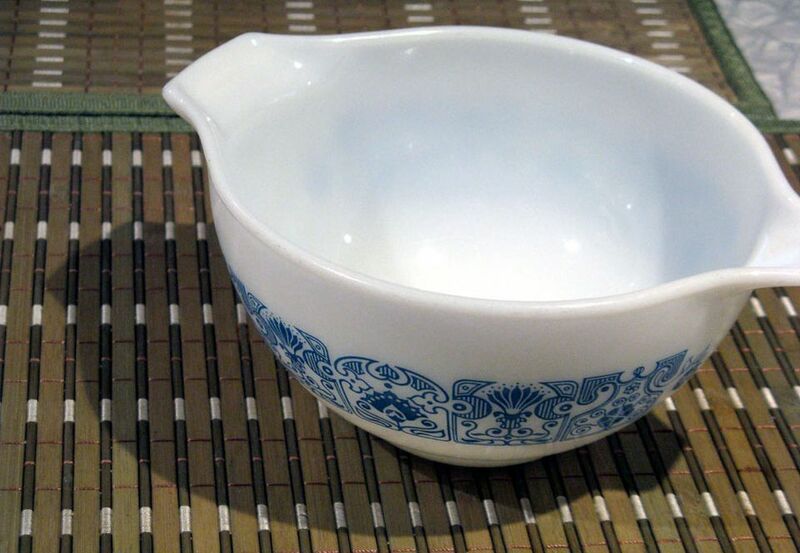 Pyrex, a product of Corning Glass Works, dates all the way back to 1915. Early Pyrex pieces were made of clear glass in many different ovenware styles. By the 1940s, pieces in solid colors were being made with great success. Then came the prints in the '50s in many popular patterns. Made from 1957 through 1968, Butterprint is sometimes called "Amish" because it features an Amish farmer and his wife with crops and roosters. It was one of the first patterns made on the popular Cinderella style mixing bowls that have a spout or handle on both sides. The first Butterprint items were either turquoise with a white print, or turquoise print on white. Other colors were made as well. "Promotional sets with orange and pink Butterprint on a white background and white Butterprint on a pink background were released in the late 1950s and early 1960s due to the design’s popularity," according to the Corning Museum of Glass. This pattern was unnamed when it was introduced in 1958 and simply marketed as a chip and dip gift set. 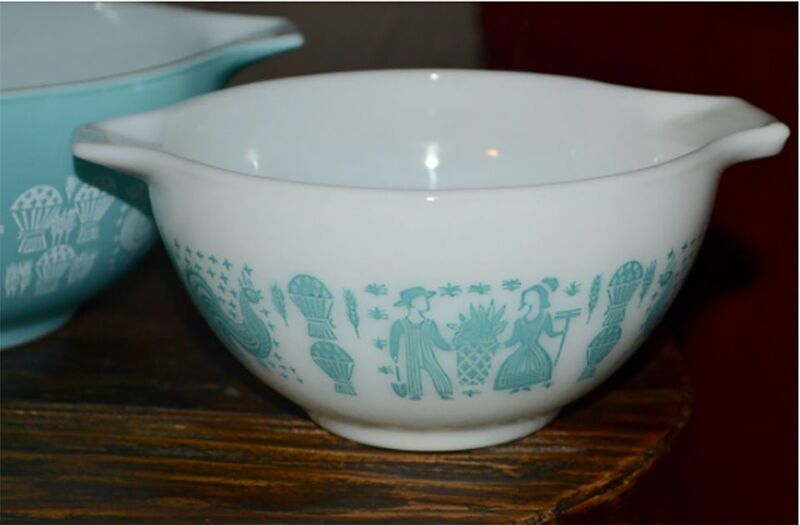 The set consisted of two Cinderella style bowls in turquoise blue with a white pattern depicting hot air balloons (as shown on the larger of the two bowls depicted here. There was also a metal bracket included so the smaller bowl could be attached to the larger one. "The set came with a suggestion card on how the new Chip and Dip set might be used. Along with using the set for chips and dips, the bowls could also be used for salad and dressing, as a punch bowl and used separately for 'mixing, serving, and baking,' " according to the Corning Museum of Glass. Many times gift sets like these were not marketed as a specific pattern by Pyrex when they were new, but collectors name them over time as is the case with the Balloons pattern. Butterfly Gold came on the market as a Pyrex Compatibles pattern in 1972 as an accompaniment to a Corelle Dinnerware sharing the same name. Another version of Butterfly Gold with a modified print (a bunch of smaller flowers with stems) was introduced in 1979. These pieces were made in gold with white printing or white with gold printing. Colonial Mist came on the market in 1983 as an accompaniment to a Corelle Dinnerware line of the same name. The dinnerware was available in blue on white or white on blue. The mixing bowl set in Colonial Mist alternated in colors to match either colorway of dinnerware. Individual bowls were also sold in both colors. There were no additional kitchenware items made in this pattern. Spring Blossom Green, commonly referenced as "Crazy Daisy," was one of the longest running Pyrex patterns. It was made from 1972 to 1981 in two different versions to coordinate with Corelle Dinnerware of the same name. Kitchenware in this pattern included a variety of mixing bowls, casserole dishes, and refrigerator sets among other pieces. The Daisy pattern was made beginning in 1968 through 1973. The colors imparted "splash of sunshine" according to vintage Corning magazine ads. The allover Daisy decor was only used on Cinderella style mixing bowls. Coordinating pieces were made in solid yellow or orange with the Daisy pattern on the lids. These are sometimes referenced as "Sunflower" by sellers. Clear lids with the flower pattern were made through 1972. In 1973, they were made with milk white (named "opal" by Corning) glass with the design printed on the top. If you find a Daisy casserole dish held in a wicker basket, chances are it is original to the piece. These were indeed sold as go-with promotional items back in the day. Dating back to 1968, this pattern came in blue, red or orange printed on opal glass (white glass with a similar look to milk glass). These are collected to complete sets, but they were actually sold separately, when they were new. Green was added to the line in 1969, and by 1973 they were no longer offered by Corning. While the name given to the line was simply, Dot, sometimes collectors call the pattern "New" Dots. The Early American pattern was made from 1962 through 1971–one of the longest-running Pyrex patterns. It was touted as "the theme of the decade" due to the popularity of Colonial decor at the time. The same pattern was also sold in Canada as "Early Canadian." Most Early American pieces were made in a gold on brown background or a brown on white background, with a few sporting white on brown. Other experimental colors were made in very limited quantities. Made from 1950 to 1959, the Pyrex pattern library on CorningMuseum.com unofficially identifies this pattern as "Eyes." Many sellers now use the term "Atomic Eyes" to describe this distinctive pattern considered to be pricey in comparison to other Pryex patterns. Not all Eyes bowls are marked on the base. However, this classic mid-century turquoise print on white opal glass is easily recognized. Gooseberry–produced from 1957 to 1966–colors were pink on white (the most common), white on pink, black on yellow, black on white and the rarely found gold on beige. Made only in a four-piece Cinderella style bowl set, the black on white and black on yellow pieces were dropped from the line in 1962. "Rare Gooseberry with a gold pattern on beige background exists, but it is unclear whether it was offered as a promotional item, a market test item or as an employee appreciation item," according to the Pryex pattern library on Corning Museum. The Horizon Blue pattern was introduced in 1969 to commemorate the Apollo 11 moon landing. It was made through 1972. The colors on Horizon Blue can vary slightly from piece to piece. The number of pieces offered in this line were limited, but it did include a variety of bowls and casserole dishes. This pattern, along with Pink Daisy, was one of the first two printed patterns released on Pyrex opal glass (white glass). The pieces were advertised as "New Pyrex Decorator Casseroles." Snowflake was in production from 1956 to 1963. The version running the longest was white on a turquoise blue background, continuing through 1967. Variations included turquoise on white available through 1963, and white on charcoal gray through 1960. Rainbow Stripes bowls were sold from 1965 through 1967 both in sets and individually. The set included a 1 ½ pint bowl (401) in pink, a 1 ½ quart bowl (402) in sandalwood, and a 2 ½ quart bowl (403) in blue. The largest of the bowls, a 4-quart with yellow stripes, was not part of the set; it could only be bought individually. Other bowls of various sizes were also available for individual purchase to mix and match. Woodland pattern kitchenware was sold from 1978 through 1983. It came in a number of pieces including bowl sets: a Bake, Serve and Store set, a Casserole set, and a variety of individual pieces. Colors included a dark brown and a lighter brown (shown here) with white printing. Corning also marketed a coordinating Corelle dinnerware set called Woodland Brown that was available through 1985.